Subaru GE GH GR GV EJ20 EJ25 engine with AVCS or Non AVCS and MAMBA TD05H TD06SL2 Turbo. 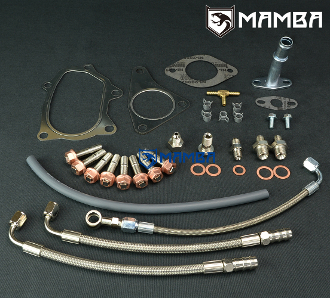 1 x 25cm 4AN Oil Feed Line Kit with 1.8mm Restrictor. 1 x 4AN to 14mm adapter fitting that convert factory AVCS 12mm flare to 4AN. 2 x 25cm 4AN 5/16" S-90 Water line kit.